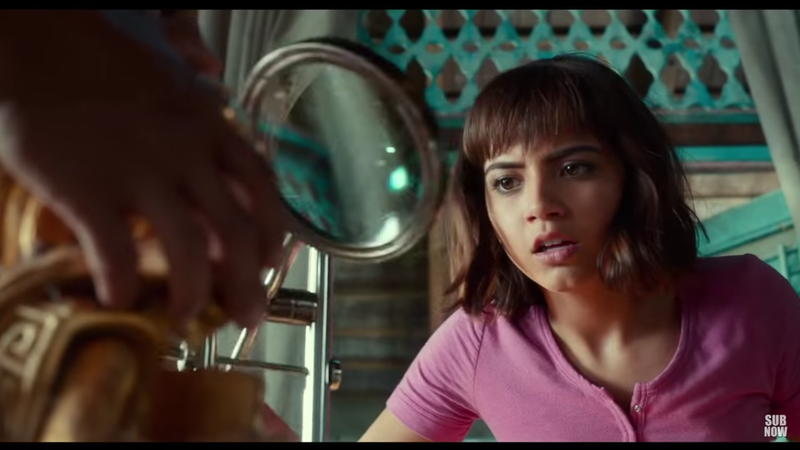 So, first of all, yes, there's a live action movie based on Dora the Explorer a Nickelodeon children's show so popular that there's almost no chance you've heard of it before. There is a monkey, some jungle exploration, language learning, not a bad show if you're stuck babysitting. Dora the Explorer movie sounds like a gag, like Funny or Die's Captain Planet reboot starring Don Cheadle, or an actual live action Dora the Explorer that College Humor put out years ago. Granted there's a massive market for nostalgia-driven content, like an upcoming Scooby Doo movie and you know, all of Stranger Things but it's not really clear who Dora and the Lost City of Gold is for, beyond maybe people who wanted confirmation that Dora would grow into Lara Croft from Tomb Raider . Anyway, the trailer has no Spanish lessons and now where Dora asks us the viewers to help here locate anything on screen but it does have a terrifying CGI monkey sidekick, so there are great accidental horror scenes to look forward to.